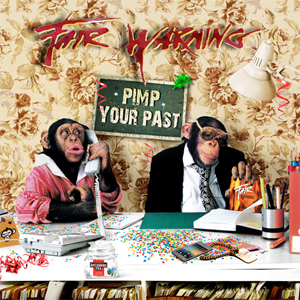 If anybody really needed additional proof that all of their songs are timeless, classic and independent of trends and fashions, then FAIR WARNING provide that proof incontestably on Pimp Your Past. The current album by the band from Northern Germany features 2016 versions of the most important tracks from their first three studio albums Fair Warning, Rainmaker and Go!FAIR WARNING underline the motto, which they have chosen for themselves: a good song will always remain a good song (at this point we will save ourselves a decisive "full stop" as an expression of absolute conviction). At the same time, it's an integral part of the Pimp Your Past concept that the arrangements of some of the new versions differ significantly from the originals. As bassist Ule Ritgen puts it so aptly: "When our Japanese record company approached us with the request for this kind of album, we were skeptical to start with. But once we had made up our minds to not simply rerecord the material but furnish it with a few fresh arrangements, the project gained momentum and we were gripped by a kind of eagerness to explore the possibilities. Especially since the new recording are very energetic and sound excitingly different in parts while their essence has remained the same. You can tell that the originals have a lot of substance and that their quality is extremely robust." So it comes as no surprise that the unmistakable spiritedness of this band, which has been on the scene for 25 years and is now throwing a new light on the beginning of their career with Pimp Your Past, is also reflected in the album's unusual cover artwork. "We've run out of dragons, unfortunately they're extinct," jokes Helge Engelke and gets to the serious core of the matter: "Of course people may wonder what this 'arty stuff' is all about. In view of the term 'pimp', a cover featuring old cars would probably have been the logical thing to go for. But honestly: who wants something normal? And after all, monkeys also stand for an early stage of the evolution of man, so the album title and the cover fit together really well. To put it in a nutshell: we played with our origins on Pimp Your Past, which was not only a lot of fun but is also expressed in this particularly humorous artwork." Pimp Your Past will be release worldwide (ex-Japan) on October 28th, 2016 as CD through Steamhammer/SPV. Mexico's CERBERUS Set To Unleash Fire! GEARS Release Music Video For "Tango Yankee"
SAINT VITUS Unveil New Song, "Useless"
CELLAR DARLING Debut New Track "Freeze"
ABNORMALITY Debut New Single "A Catastrophic and Catalyzing Event"
EXODUS Celebrate 40th Anniversary With Unearthed Live Single, "No Love (Live At Day In The Dirt 1984)"
SNEW Release New Video For Track "Sharpie"
BEASTO BLANCO Releases Music Video For "The Seeker"
KNAC.COM Exclusive: AFTER THE FALL Debut Lyric Video For "The Fight"
VENOM Stream Track "Bring Out Your Dead"
GLORYHAMMER Release Namesake Video For "Gloryhammer"
SANTA CRUZ Return With New Song "Changing Of Seasons"
ABBATH Unleash Fiery New Music Video, "Harvest Pyre"
NEW YEARS DAY Release New Song "Come for Me"
EUROPE Release New Single, Video, "Turn To Dust"
KHEMMIS Announce North American "Desolation Tour"
GHOST Announces Fall 2019 North American Dates, The "Ultimate Tour Named Death"
DEVIN TOWNSEND Launches Video For "Spirits Will Collide"
ALLEGAEON Launches Video For "Extremophiles (B)"
THE DAMNED THINGS Stream New Track "Something Good"
STRYPER Announces 2019 "History Tour"
DEE SNIDER Debuts Video For "Lies Are A Business"
KAMELOT Stream New Track "Vespertine (My Crimson Bride)"
WITHERFALL Stream Acoustic Version Of "Ode To Despair"